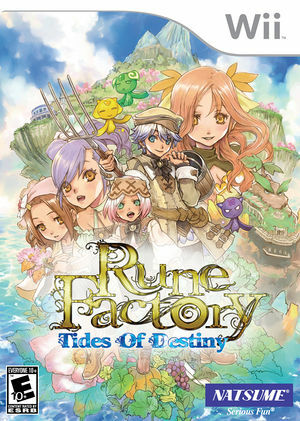 Rune Factory: Tides of Destiny (known as Rune Factory Oceans in Japan) is role-playing game. Players control a male and female character in one, the male side named Aden and the female side named Sonja, as they traverse the seas on a giant beast named Ymir. The beast can raise sunken islands and ships from the sea. Players will be able to farm, fight using a real-time battle system, and form relationships. The lenses flares show through walls and buildings throughout the game. This may seem like a bug, but this issue actually happens on console as well. Certain sprites (spherical lights in particular) will have lines right down the middle of them. This happens on console as well. It is not be possible to control player's combat monsters with a emulated Wii Remote controls due to the shake function being too weak. Using a real Wiimote works fine. The graph below charts the compatibility with Rune Factory: Tides of Destiny since Dolphin's 2.0 release, listing revisions only where a compatibility change occurred. r7358 Windows 7 Intel Pentium E5300 @ 3.6GHz NVIDIA GeForce 9800 GT 60FPS. Positive. Game may run too fast. The game is very stable. 3.0 Windows 7 Intel Core i5-2500K @ 3.3GHz ATI Radeon HD 5450 Using 1 x Native at resolution 1024x768, Work best with OpenGL. Set 60FPS and check limit by FPS for stable sound using HLE DSP. 3.0-159 Windows 7 AMD Phenom II X4 @ 3GHz ATI Radeon HD 4870 Perfect when you use DSP LLE. Framerate drops in dungeons when there are a lot of enemies, but mostly runs at a steady 30FPS.